I’m so exited to share this recipe with you, and specially with the #TwelveLoaves group. We are inspired this month by pears, making all kinds of incredible, different and delicious recipes, the I’m sure you can’t wait to make at home. I made for you this low, sugar, gluten free muffins, yes gluten free, my first recipe like this, and let me tell you’re not going to miss the flour, because I add some almond flour to complement and to give this muffins a different twist. Made with cook pear and a lot of love, are our new favorite, not because I made but because my family love to try new and different recipes. So I really hope you make them and let me know if you like them. In a sauce pan, place pears, cinnamon, brown sugar and lemon juice and cook for 5 minutes in low heat or until the pears are soft. In a bowl mix together oats, almond flour, salt and baking soda. In other bowl mix eggs, vanilla, oil and sugar. Once the pears are ready add to the oats mixture and stir then add that mixture to the egg mixture and stir until well blended. You need to have ready a muffin tin with some liners, them add 2 tablespoons of the mixture, bake for 26 minutes. 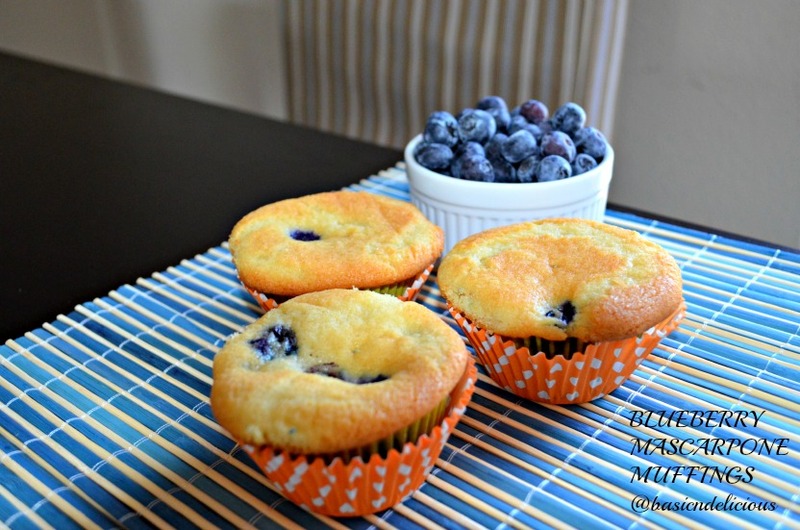 This muffins are a great snack for school or as a breakfast. #TwelveLoaves -September: Hosted by Camilla of Culinary Adventures with Camilla. Welcome, fall baking! The month of August was all about baking with fresh, summer herbs. September is all about baking with PEARS! Whatever you bake, (yeasted, quick bread, crackers, muffins, braids, flatbreads, etc) have fun and let’s have a delicious month of bread with Pears. Let’s get baking! 3. Have your Twelve Loaves bread that you baked this September 2014, and posted on your blog by September 30, 2014. #TwelveLoaves runs smoothly with the help of our bakers. A big thanks to Camilla of Culinary Adventures with Camilla for hosting our event! #TwelveLoaves is a monthly bread baking party created by Lora from Cake Duchess and run with the help of Heather of girlichef. These delicious muffins taste very different, are really something else that would please the whole family. They are not extremely sweet and that makes these muffins the perfect choice for an afternoon coffee in the company of friends. Not the most attractive muffins but I assure you they are delicious and perfect for any occasion. Preheat oven to 350 degrees F (176 degrees C). In mixer bowl add the sugar and butter, beat until sugar is well incorporated with the butter, add the mascarpone cheese. Add the eggs one by one, milk and vanilla, beat for 3 minutes. Sift flour in a bowl, baking powder, baking soda, pinch of salt and add to creamed mixture gradually allow beating until well incorporated. Remove the bowl and add the berries, mixing carefully to keep the shape. In a muffin pan place paper caps and add portions of the mixture, bake for 30 minutes. Once ready remove from oven and let cool in pan for 15 minutes, then move to wire racks to cool completely. This recipe makes 24 muffins. Estos deliciosos muffins tienen un sabor muy diferente, son realmente algo que agradara a toda la familia. Son son extremadamente dulces y eso convierte a estos muffins en la opción perfecta para una tarde de cafe en compania de amigos. No son los muffins mas atractivos pero le aseguro que son deliciosos e ideales para cualquier ocasión. En el tazón de la batidora agregue el azúcar y la mantequilla, bata hasta que el azúcar se halla incorporado bien a la mantequilla, agregue el queso mascarpone. Agregue los huevos uno a uno, la leche y vainilla, batir por 3 minutos. Cernir en un tazón harina, polvo de hornear, bicarbonato, pizca de sal y agregue a la mezcla anterior poco a poco, deje batir hasta que este bien incorporado. Retire el tazón y agregue las moras, mezclando con mucho cuidado para que mantengan la forma. En un molde para muffins coloque capsulas de papel y agregue porciones de la mezcla anterior, hornee por 30 minutos. Una vez listos retire del horno y deje enfriar en el molde por 15 minutos, luego pase a una rejilla a que terminen de enfriar. De esta receta salen 24 muffins. 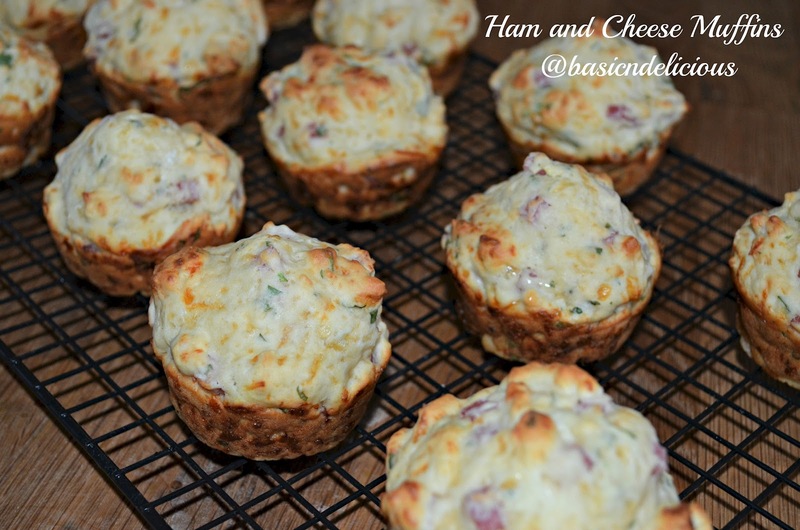 These delicious muffins with ham and cheese will simplify the work in the morning because they are easy and quick to make. It’s a full breakfast in one bite. These muffins are the favorites of my family and also are ideal for a picnic. I invite you to try these delicious muffins that are full of flavor. Preheat the oven at 400 degrees F (200 degrees C). Place the flour, baking powder and salt in a bowl, add the ham, cheese and cilantro. Separately incorporated sour cream, egg, milk and add to mixture above. Place the mixture in portions in a muffin pan previously greased. Bake 18 minutes, let cool in the pan for 15 minutes and move to a wire rack to cool completely. Estos deliciosos muffins de jamon y queso le simplificaran el trabajo en la mañana. Son faciles y rápidos de hacer y no le quitaran mucho tiempo. Es un desayuno completo en un solo bocado que dejara a pequenos y grandes pidiendo mas. Son los favoritos de mi familia y los fines de semana se acaban muy rápido, también son ideales para llevar a un día de campo. Los invito a probar estos deliciosos muffins, que están llenos de delicioso sabor. Precaliente el horno a 400 grados F ( 200 grados C ). Coloque la harina, polvo de hornear y sal en un tazón, agregue el jamón, queso y cilantro. Por aparte incorpore la crema agria, el huevo a la leche y agregue a la mezcla anterior. Revuelva hasta que todo este bien incorporado. Coloque porciones de la mezcla en un molde para muffins previamente engrasado. Hornee por 18 minutos, deje enfriar en el molde por 15 minutos y pase a una rejilla a que enfríen completamente. Almacene en un contenedor hermético. De esta receta salen 12 muffins. 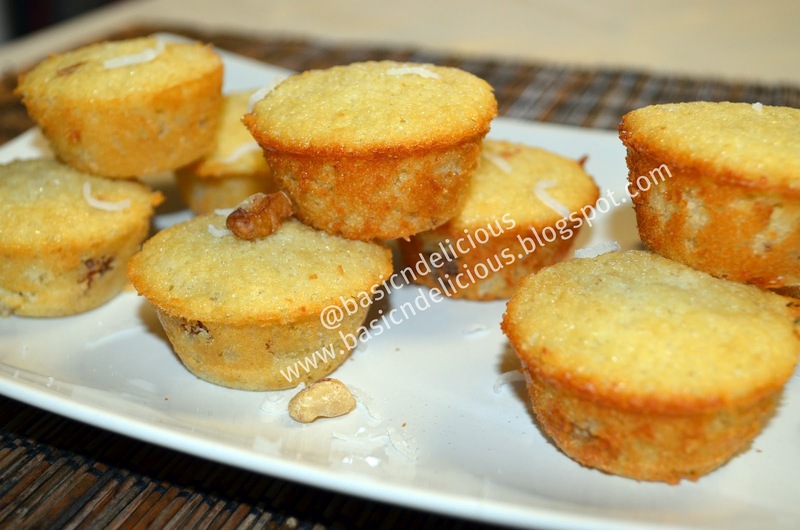 Delicious small bites of coconut and nuts, completely irresistible to fill your mornings and evenings with flavor. Great for any activity and ideal for dessert or coffee afternoon,with a tropical flavor unsurpassed. Bits of nuts and coconut flavor in your mouth will make a tropical holiday. I invite you to try them you will be delighted from the first bite. Creme sugar and butter, add eggs and incorporate well. Add flour mixed with salt and baking powder, followed by milk. Stir well and add the vanilla, coconut extract,, nuts and coconut. Have ready a small muffin pan and fill with the mixture to the edge of each. Bake at 350 degrees F (175 degrees C) for 20 minutes. Let cool for 5 minutes and cool completely unmolding on a rack. This recipe makes 20 muffins.